Last Day Bible Prophecy: I thought the Temple WAS destroyed in 70AD? She wrote: "I thought that the Temple WAS destroyed in 70AD and that the Wailing Wall is not part of the Temple but a retaining wall for the foundation upon which the Temple stood. Comments?" "In 66 CE the Jewish population rebelled against the Roman empire. 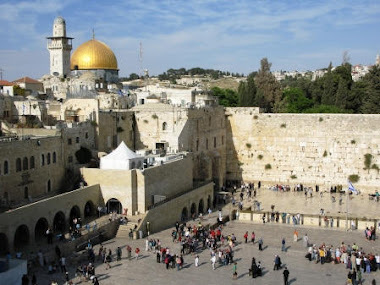 Four years later, in 70 CE, Roman legions under Titus retook and subsequently destroyed much of Jerusalem and the Second Temple... the Western Wall is not the only remaining part of the Temple Mount. Currently, Robinson's Arch (named after American Edward Robinson) remains as the beginning of an arch that spanned the gap between the top of the platform and the higher ground farther away. This had been used by the priests as an entrance. Commoners had entered through the still-extant, but now plugged, gates on the southern side which led through beautiful colonnades to the top of the platform. One of these colonnades is still extant and reachable through the Temple Mount. The Southern wall was designed as a grand entrance. Recent archeological digs have found thousands of mikvehs (ceremonial bathtubs) for the ritual purification of the worshipers, as well as a grand stairway leading to the now blocked entrance. Inside the walls, the platform was supported by a series of vaulted archways, now called Solomon's Stables, which still exist..."
"See ye not all these things? verily I say unto you, There shall not be left here one stone upon another, that shall not be thrown down. (Mat 24:2)"
"Seest thou these great buildings? there shall not be left one stone upon another, that shall not be thrown down. (Mar 13:2)"
"As for these things which ye behold, the days will come, in the which there shall not be left one stone upon another, that shall not be thrown down. (Luk 21:6)"
So, if this is written to our time, why would believing Jews wait until they see the abomination to flee. Considering the belief that two-thirds will perish in the Land, why would they stay? Surely this is not speaking to unbelieving Jews who refuse to open a New Testament, but rather to believers. You would think that they would leave as soon as they saw the temple being built. "You would think that they (Jews who are Believers) would leave as soon as they saw the temple being built." "And there came unto me one of the seven angels which had the seven vials full of the seven last plagues, and talked with me, saying, Come hither, I will shew thee THE BRIDE, THE LAMB'S WIFE. And he carried me away in the spirit to a great and high mountain, and shewed me that great city, the holy Jerusalem, descending out of heaven from God, Having the glory of God... And had a wall great and high, and had twelve gates, and at the gates twelve angels, and names written thereon, which are THE NAMES OF THE TWELVE TRIBES of the CHILDREN OF ISRAEL: On the east three gates; on the north three gates; on the south three gates; and on the west three gates. And the wall of the city had twelve foundations, and in them THE NAMES OF THE TWELVE APOSTLES OF THE LAMB (Rev 21:9-14). The sign discussed above, called "the abomination of desolation, spoken of by Daniel the prophet" is not "the temple being built."